Just booked this myself - seems good value if you were planning a midnight watch of The Last Jedi, as for the same price you can catch The Force Awakens right before! All the nationwide cinema chains seem to be doing this, and generally prices seem to range between £12-15 which is great for 2 films. Depending on your location, there's also a choice between 2D and 3D. "Come back to a galaxy far, far away with a spectacular Star Wars Double Bill! 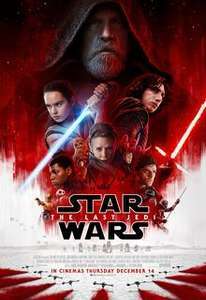 Re-live 'Star Wars: The Force Awakens' on the evening of the 13th before watching the first public show of the long awaited 'Star Wars: The Last Jedi' at 00:01 on 14th December. Thirty years after the death of the Emperor and the destruction of the second Death Star, a new generation of heroes rise up to fight the revived Dark Side. Picking up right where ‘The Force Awakens' left off, ‘Star Wars: The Last Jedi' finds Rey, after finally discovering Luke Skywalker, beginning her training in the ways of the Force." I did something similar for Guardians of the Galaxy. I was knackered at the end and I'm not sure I will ever do that again LoL Plus in order to get a decent seat I have already rebooked for the Last Jedi. It's interesting that the BFI Imax is not included in this deal though. BFI IMAX don't even accept Meerkat 2-4-1 codes. Almost impossible to ever get a decent deal at that flagship cinema. Mind you, they still often sell out well in advance though! Whoa... Not sure I could sit still for that long but... Whoa! It's interesting that the BFI Imax is not included in this deal though. Yeah, they are showing The Force Awakens at a cheaper rate than usual but most of The Last Jedi showings are now fully booked! Yeah, they are showing The Force Awakens at a cheaper rate than usual but …Yeah, they are showing The Force Awakens at a cheaper rate than usual but most of The Last Jedi showings are now fully booked! BFI IMAX don't even accept Meerkat 2-4-1 codes. Almost impossible to ever …BFI IMAX don't even accept Meerkat 2-4-1 codes. Almost impossible to ever get a decent deal at that flagship cinema. Mind you, they still often sell out well in advance though! BFI IMAX pretty much sold out its sessions for TLJ in October, when they FIRST went on sale. Look elsewhere for this deal. Does not appear to be working. Price is £17. Certainly not a single ticket price. Must be venue-specific. What level of madness is this?! Vue in Manchester Printworks £4.99 plus 75p booking fee. I think it depends on location - my local Odeon was around £15, but a nearby Vue was only £12. Also, 2D/3D/Imax make a difference. That said, if you have a Limitless subscription, this is included so nothing extra to pay! Nottingham Cineworld (Cornerhouse) is 3D Imax for 21 quid in case that saves anyone checking. Seat availability is non existent tho. Off topic but further to comments about pricing and regions. There’s a huge difference in ticket pricing for my two local ones. Bracknell and Maidenhead. Both in Berkshire, and they’re both Odeon. 9/10 miles from one another, but the Bracknell one is nearing half the price for films. The Star Wars double bill = £7.75 at Bracknell...The only down side being it’s a pretty run down cinema. If you like your films and you’re near one of the dearer Odeon etc, Limitless is well recommended. Empire IMAX 3D (Birmingham and Swindon) double-bill is £11.50 a ticket which is superb value for two movies in IMAX! If they still have any tickets left, Thursday 7th Dec onwards you'd be able to use a Meerkat code also but you do have to pay a small surcharge for the second ticket as this is not a regular 2D movie. Wouldn't cost much more than a single IMAX ticket though and here two people would each get to see two movies in IMAX. Maidenhead is a lot more classy compared to Bracknell, that's probably why but I agree there is no reason why some cities like Manchester can offer £4.99 tickets all day everyday whilst many other parts of the South of England (excluding London) seem to charge 2 - 3 times as much. Two tickets for this double-bill at Cineworld, Leicester Square London costs an eye-watering £65.40 and was practically sold out two months ago! Lots of people with too much money in London, lol! Two tickets for this double-bill at Cineworld, Leicester Square London …Two tickets for this double-bill at Cineworld, Leicester Square London costs an eye-watering £65.40 and was practically sold out two months ago! Lots of people with too much money in London, lol! Bargain that! ‌ ‌ Hahahaha! if youre going for the midnight showing, the geminid meteor shower prime viewing is at 4am on December 14th so remember to look up! Thanks for this OP. Managed to book the double bill at Vue Leicester using one of my Club Lloyds cinema vouchers so cost me exactly £0.00! Bargain. As this starts on a Wednesday, will you be able to use a Meerkat code? I've got tickets booked to see VIII on day one, but I'll just watch VII on blu ray the day before - can't be done with sitting in the cinema for 5 hours watching them back to back at my age! So for free you get to sit through the abomination that was The Force Awakens. Perhaps that might give the new one a glimmer of 'new hope' that its any good, after just seeing the other one, it can only get better. I wonder will they in a 10min meeting to do exactly like they did in the last 3 movies, sneek in to take down (poorly defended) defences and then blow a monster sized weapon up, that managed to be built again without anyone noticing. Possibly but depends on which cinema you wish to go to? Vue's site accepted a Meerkat code for the Kingsman double-bill whilst Cineworld's site wouldn't. Most, if not all, cinemas seem to have cottoned on now with the regards to Meerkat codes and if you try using any other promotional code or offer then they won't allow you to also use a Meerkat code. Empire and Cineworld for example no longer accept Meerkat codes on Super Saver Tuesdays whereas previously they used to. My local has added another screening for the double bill (The Last Jedi is showing through the night!) so if you couldn't find a seat before, i might be worth checking for extra showings before release. The Last Jedi did not disappoint. Solid installment, possibly even the best, in the Star Wars franchise. Very entertaining especially in IMAX 3D.